So, you are growing chillies. Maybe even enjoying the first fruits of your labour – but what now? At the end of the growing season, and when the temperature drops below about 10 degrees C at night (in the UK this is about the end of October) plants start to shut down for the winter as their job of producing chilli seed pods is done. At this time, usually the plant will slow its growth to almost nil, therefore reducing its sunlight and water intake requirements drastically, whilst preparing for the long winter months ahead. – As soon as your plant has finish fruiting – make sure you pick all the ripe chilli seed pods from your chilli plant (this tells the plants to produce more in future). 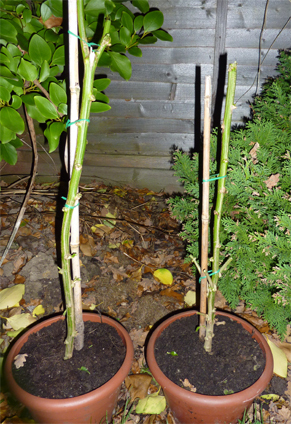 – Next, you would want to prune your plants right back, leaving just a short stem – this includes trimming back the majority of vegetation. This may sound like a harsh thing to do, however it will help your plant to concentrate its energy and not waste any during the winter trying to sustain all that vegetation. – You can also repot your chilli plants in slightly smaller containers in order to concentrate your plants energies into a smaller space ready for hibernation. – And finally, make sure you move your chilli plants some place warm to give them the best chance of surviving the winter (preferably in a greenhouse or near a sunny window sill indoors where the average temperature will be higher, which helps your plants during the cold winter months. Make sure that you water your chilli plants much less often during this stage as to prevent the water sitting in pots and promoting the growth of mould. Do not worry – your plants will be using much less water during this hibernation-like stage. Up to 2 weeks between watering is fine – just make sure you check that the soil is moist but not damp. If you are unsure of how much water is just right, you can use a moisture tester which is available from any good garden centre – look at maintaining around 25% moisture in the soil. If you are successful, your efforts will be rewarded in many different ways. 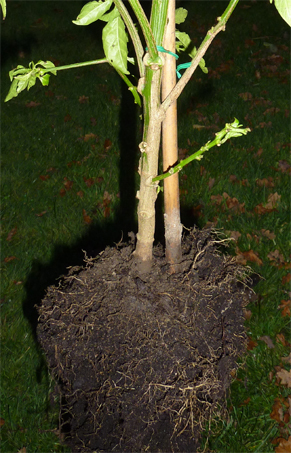 First of all, when Spring does arrive, your plants already have well established roots balls and stems. Give them a couple of weeks after Spring has arrived and they will start producing new shoots and leaves. This gives you a great advantage over planting chillies from seeds and your over-wintered chilli plants will start producing fruit much earlier in the growing season – this has the added benefit of a longer harvesting period, so not only will your plant produce more chillies, it will produce them for a longer duration! You can expect your chilli plants to last for many years by over-wintering them properly – so when you’ve picked your last chilli of the season – why not start over-wintering for lots more in future? For a little bit of effort, you enjoy both the challenge of looking after your plants during the winter when there very little else happening in the garden, and enjoy the many additional benefits when Spring finally does arrive. If you follow these tips, your chilli plants will be ready for a great growing season come Spring time – Saving you time and improving your chilli harvests! 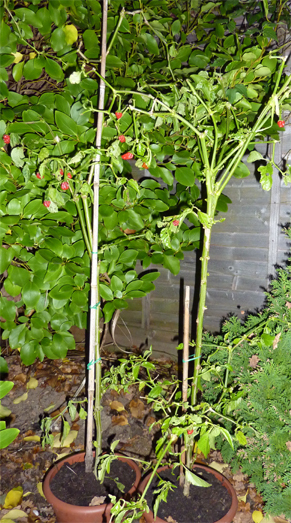 Chilli plants pruned and ready for overwintering – Much like roses, you have now allowed your chilli plants to conserve their energy throughout winter. Make sure you being them indoors and keep them warm now – they don’t like frosty feet!